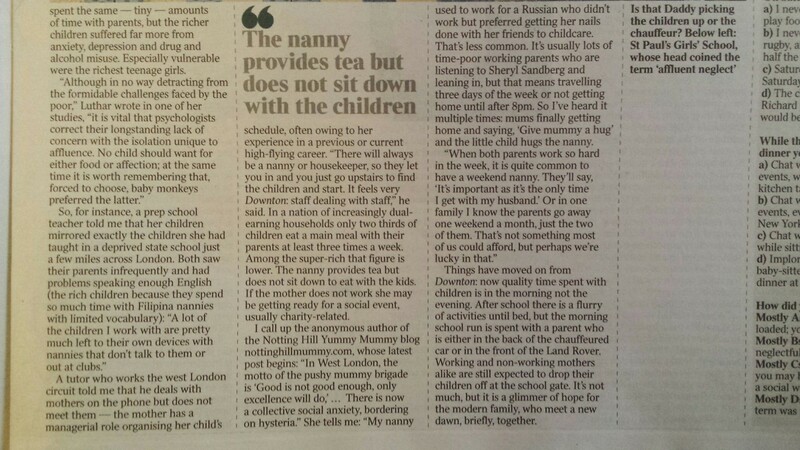 I was interviewed yesterday by Helen Rumbelow of the The Times Newspaper on my thoughts on ‘Affluent Neglect,’ the notion that rich parents spend very little time with their children, for her article in today’s paper ‘Affluent Neglect: when did you last see your kids?’ in the T2 Section. Of course, there is the small minority of super rich and women who do not particularly like motherhood who wilfully do not spend time with their children, but most of the time this isn’t the case. I explained that the majority of parents I know who spend the least amount of time with their children are those with double income careers, and it is a choice we make as mothers and women. For a woman to be a high flying surgeon/politician/entrepreneur, sacrifices have to be made, and children’s time is one of them. On one hand we are told to be like Sheryl Sandberg and to ‘lean in,’ be the next Hillary Clinton/Angela Merkel/Sheryl Sandberg/Arianna Huffington/Nathalie Massanet but to also be present parents. I’m afraid those two don’t go together. If you want to make partner in a law firm/private equity shop/hedge fund/consultant, you will have to put in the time, even if that means only seeing your child 1 hour a day or only on weekends. The ‘affluence’ of parents doesn’t come from nowhere, they have worked hard at it. I used to work in a position where I would have to sometimes work until midnight and could not easily fit in my children’s christmas plays/christmas fairs/sports days into my schedule, or take them to the doctor if they were sick. I eventually chose to give up my career in favour of my children: https://nottinghillmummy.com/2014/06/26/quote-of-the-day-but-mummy-only-daddies-work/ But, I am also left with a malaise that I am not ‘fulfilling my potential,’ that all my years of education and hard work are wasted. Women having it all are the only women who don’t care for motherhood or don’t care for their careers. So, although this article focuses on children being neglected, the whole issue of how to work and parent at the same time is not completely addressed. Even Nicola Horlick, the one-time ‘Superwoman’ who balanced a family of 6 children and a high powered financial career, says you can’t have it all. http://money.aol.co.uk/2014/10/25/nicola-horlick-superwoman-you-can-t-have-it-all/ And all high powered women say that they need a good support network, which means, nannies in most cases since most of us do not have young grandmothers who live next door and are willing to take care of their children. Yes, many parents don’t spend enough time with their children, but we have also been told as women that we should be independent, lean in, be the head of a company, and therefore we are pulled in opposing directions. We end up feeling either a) guilty of being at work and not with our children or b) being at home with our children and losing ourselves and our identities, day by day, little by little, when we focus on only our children. Also, many families now need both parents working to afford the expensive cost of living. In some respects, isn’t it also good to show your children a good work ethic? Or is better to be there every night to sing a song and read them their bedtime stories? For those who have found the right balance, please do impart your wise knowledge.